“This one relates to a newborn baby. Newborn babies often suffer from something called thrush, which is just an infection in their mouth, It's a yeast type of infection from breast feeding,” Wisser said. Another client ended up at the hospital after being instructed to take a pill twice a day instead of once. Prescription errors can lead to additional health problems, hospital stays and even death, Wisser said. Getting specific details about potential pharmaceutical errors are not easily accessible. “You can tell if they've had some disciplinary action that was taken against them in the past. You know, there is information available, but not every single detail, to protect the consumer,” Jonathan Harris, the Commissioner of the Department of Consumer Protection, said. The Troubleshooters requested the actions taken against pharmacists in Connecticut over the past two years from the DCP. The Drug Control Division of the DCP investigates complaints about prescription errors and pharmacies for the Commission of Pharmacy to review. Issues including wrong drugs, strengths, directions, patients, quantity, expired or mixed medications as well. According to state records, at least three pharmacists surrendered or had their licenses revoked based on allegations of drug or alcohol abuse. A dozen other disciplinary cases involve prescription errors, but finding out specific details is next to impossible. “You can get the minutes from the pharmacy commission and you can get the results of the investigation and what disciplinary action was taken, you know what the reason for it, but what you can’t get is just the investigative files of all the details of what happened and that is for protection of confidentiality and we’re not just saying that, it’s what is required under law,” Commissioner Harris said. 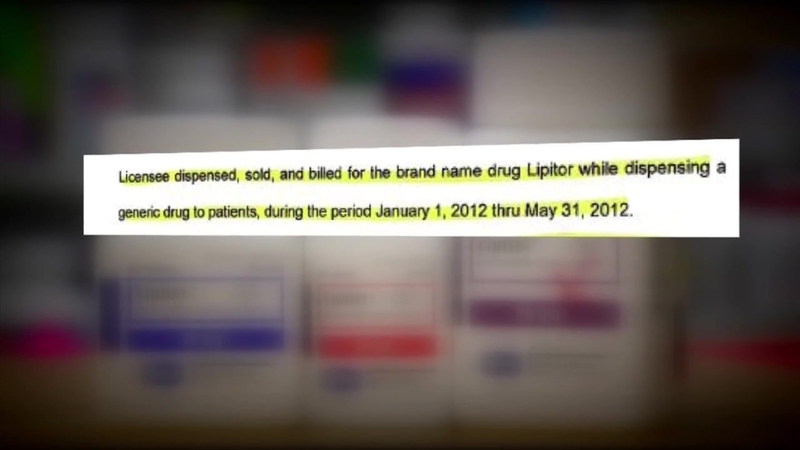 In April 2015, the state accepted a $20,000 settlement from pharmacist Ajay Desai, who was accused of selling and billing for the brand name drug Lipitor while dispensing a generic drug to patients for part of 2012. We reached the pharmacist by phone, and he said he had no comment. The license of pharmacist Jane Beeba is no longer active in Connecticut. From August 2009 to August 2014, the DCP alleges Beeba “forged and filled drug prescriptions for tramadol,” which is an Opioid paid reliever, in violation of the law. Beeba never got back to us for a comment. Margie Giuliano, the executive vice president of the Connecticut Pharmacists Association, said these findings are not unusual. “I think they’re very typical and I think it is important to say that pharmacists don’t get up every day thinking that they are going to go in and have a prescription error,” Giuliano said. Most, Giuliano said, have systems in place to prevent prescription errors, but even still, they do happen and she added her pharmacists are very concerned about the so-called workload issue. “So we formally sent the commission asking them to address the issue, I know in the process of doing this, first step is to commission the University of Connecticut School of Pharmacy to develop a survey that they could ask pharmacists about workload, metrics and the impact on public safety," Giuliano said. For now, the commissioner, lawyer and pharmacist all have the same recommendations for the consumer and that is to be your own best advocate. Get to know your pharmacists like you do your doctor, research the drugs you’re being prescribed, and if you can’t read the doctor’s handwriting, ask for a print-out instead. Double and triple check your medications before you leave the pharmacy and don’t be afraid to ask questions.